Above: nine cards from a 48-card pack featuring caricatures of four film comedians: Chaplin, Lloyd, Keaton and Turpin. 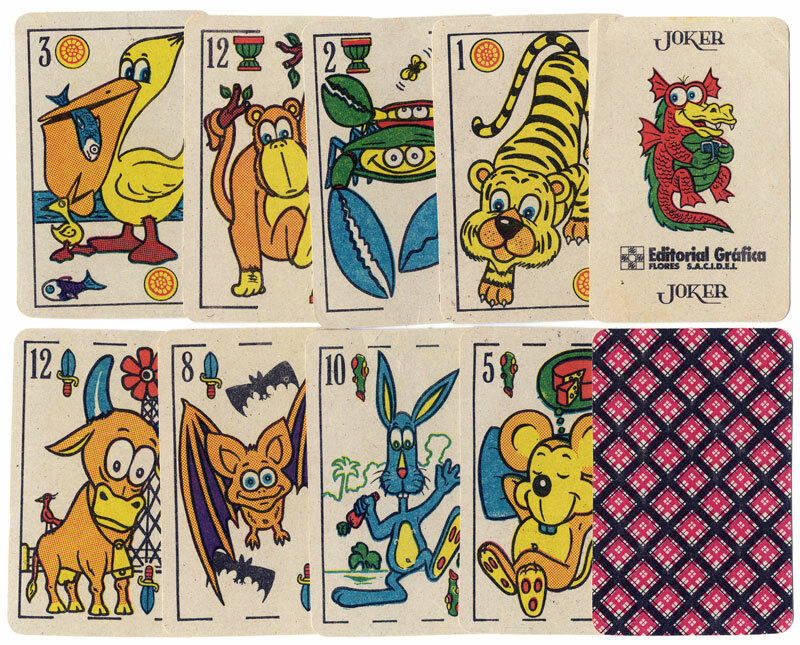 A rhyming couplet describes each scene and a miniature playing-card appears somewhere in the design. On the reverse a blank panel could be overprinted with publicity material. A number of different chocolate makers from Barcelona and Valencia availed themselves of this pack at different times. Published under the name of Fénix of Barcelona. Images courtesy José Manuel Murcia. See also: Baraja Cinematografica, c.1925 • Comic Animals (Argentina) • Spanish Historical Characters, c.1896 • Carreras Playing Cards and Dominoes, 1929 • Zoo Comics, 1968 • “El Perú” Fabrica de Cigarrillos Roldan y Cia.